Chatting to a guest recently she told me how much she enjoyed my blogs but felt that I did not write enough about my hounds! Well, I never need an excuse to talk about Honey and Purdy. I took them recently on a short break to Wales with my two sons. 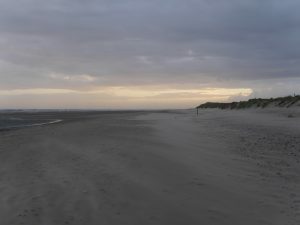 We stay at the same place year in year out – the location is fabulous as it’s a short walk over the dunes to the beach which is sandy. 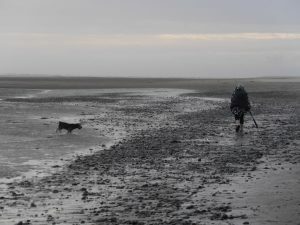 You can walk for several miles along the sands to the next town – both my dogs love the sea and the youngest is constantly running around chasing the ball along the beach or galloping into the waves to get the ball. They were completely spoilt these few days as they were walked in the morning for a couple of hours and also in the evening whilst we watched the sunset. The coastal village of Aberdovey is very dog-friendly, there is a dog whisperer alongside a gift shop selling all things for your pet and even the local award winning ice cream parlour has produced an ice cream for dogs – its called Doggi Yoggi. I have been visiting this spot for the past eighteen years, a girlfriend of mine who I met in 1976 when we were both chalet girls in Val d’Isere, live nearby so it is a great excuse to see her and have a catch-up. Having a few days away was a lovely break and has set me up for the month of August and beyond. We filled our days with visiting Art Galleries and shopping in the local markets. We also stopped by a local distillery called the Dyfi Distillery and brought back home, a new gin called Hibernation – it’s a gin that has been aged in white port barrels and I must admit it tastes delicious. It also won the best gin of 2017 as featured in the Independent! Whilst chatting to the owner of the gin company he told us about a restaurant with rooms nearby that did a tasting menu called Ynyshir… Well, we all three decided to treat ourselves to the experience and it was an amazing evening of dining, we had the taster menu and it was out of this world. Keep an eye out for my next blog, I have some BIG news!